When you are getting to the stage of actually selling your photographic work to friends, family and customers you need to make the most of the printing media available to ensure you make that sale. The customer needs to have your picture printed in a way that will suit their interior decor so take a look at these 5 ways to maximise print sales. This is a popular way to offer your work and probably the most cost effective. If you don’t have a good printer yourself you can simply use an online printer such as http://www.photobox.co.uk to get the job done. The downsides to poster prints are that the customer has to then get them framed and there may not be enough profit margin in it for you. Canvases have become very popular over the last decade and look really great on a suitable wall space. They are printed on canvas material and wrapped around a wooden frame of stretcher bars which are then ready to hang. Because of the frame they stand away from the wall and can look stunning. You will find many canvas printers online or you can even buy canvas kits to do it yourself. Triptych canvases are where the image is split across 3 canvas panels (also known as ‘split frame canvases’). These again are very popular but will cost a lot more to make as essentially you are having 3 canvases printed. The bonus is that for a lot of images they look very dramatic and can provide a real focus point for the room. Don’t expect to be able to match the prices customers can find in shop retailers like Next though. They get their prints mass produced in foreign countries which brings their prices down immensely. Printing triptych canvas art on-demand is costly but some customer are willing to pay for it. The quality will be much higher too. Photos on acrylic are a relatively new way to display your work. There are two methods you will find online. Some companies like to print directly onto acrylic sheets whilst some prefer to print on photo paper and bond this to the back of the acrylic. There are pros and cons for both, and one might work better with certain images. Acrylic is like perspex, and they are usually finished off with nice contemporary fixing posts in each corner. The beauty of acrylic prints is they look so glossy behind the acrylic that it makes the picture stand out wonderfully, creating a punchy, modern piece of wall art. If you want to offer your clients or friends a funky new alternative to the age-old framed print then photo blocks are just the ticket. These are freestanding chunky acrylic blocks that have the photo bonded to the rear section. The thickness of the blocks helps create a 3D style to the image as the light wraps the image around the sides of the artwork. As with acrylic wall prints, these are punchy, contemporary and bright prints. If you are looking for a company in the UK who can offer all these print options then try Fotoviva Art Prints and ask them for a bespoke quote. They offer a friendly and professional service for photographers across the country. So now you have some inspiring print options to show to your customers which will help you sell more of your images. Get some prints made and see for yourself how your photographs look on these different print medias. 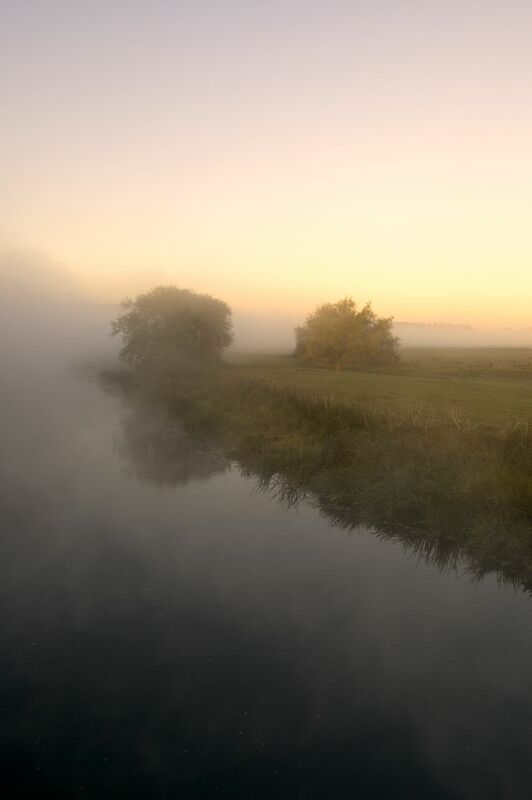 This is a photo I took a few years back on an early morning walk down to the river – I call it Riverline. To me this is one of those hidden gems you find as a photographer that you come across in your vast image library that may have been forgotten. I really like this photograph – the colours and subdued and the fogginess of the scene adds to the atmosphere of the picture. The composition is good and the simpleness of the scene strikes me. I once did a canvas print of this for a customer and it looked really nice. What do you think of it? Perhaps a bit more saturation would help? Do you have any images you have forgotten that are worth digging out? Sometimes it’s easy to get lost in all the new images you take as a photographer, especially if you don’t have a good system to keep them all organised.